The core is known as L1014, the 1,014th object in a list of dark, dusty "clouds" compiled by astronomer Beverly Lynds over 40 years ago. These have proved to be homes to a rich variety of molecules and are the birthplaces of stars and planets. NASA's infrared eyes are probing the beginnings of both stars and planets. In two separate observations, the Spitzer Space Telescope has uncovered the warm glow from a possible stellar infant and an icy disk where planets may one-day form. Spitzer, which launched a year and a half ago, can see astronomical objects that are too faint or too cold for other telescopes to see. Its infrared detectors make it especially good at studying the early stages of star and planet formation. "These processes are hidden behind clouds of dust," said Neal Evans of the University of Texas. "But longer wavelength infrared light penetrates the dust better." Spitzer's spectrometers can also detect the presence of molecules, which absorb light at certain infrared wavelengths. "I think what really makes this telescope special is its high sensitivity, especially in spectroscopy." said Klaus Pontoppidan of Leiden Observatory in the Netherlands. The new discoveries were presented this week at the first Spitzer science conference in Pasadena, CA. The telescope is managed by NASA's Jet Propulsion Laboratory. In the first result, a group led by Evans saw a warm, mysterious glow in a lonely region of space called a "starless core." Filled with dense knots of gas and dust, these cores are presumably not yet ripe for stars. But when Evans and his colleagues looked at one core called L1014 -- in the direction of the constellation Cygnus, they were surprised to see a faint, star-like object. "It turns out [L1014] had something in there," Evans said. "But we aren't sure yet what it is." Because the object is embedded in the dust cloud, Evans explained that it had to have formed recently, perhaps 100,000 to a million years ago. Assuming that L1014 is about 600 light years away, the astronomers have estimated that the new astronomical body is emitting energy at one tenth the rate of our sun, which would be unusually dim for a young star. The most likely hypothesis is that this is the youngest brown dwarf ever found. 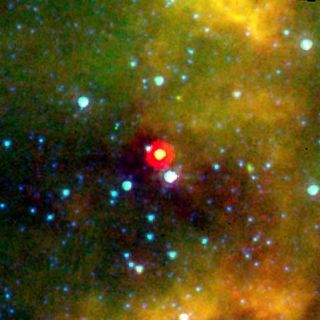 A brown dwarf is a failed star -- a ball of gas that is too big to be a planet, but not massive enough to ignite nuclear reactions in its core, as "successful stars" do. Although brown dwarves have been seen before, a lot of questions remain as to how they form, Evans said. One other possibility is that the detected object is a newborn star, which is growing more slowly than a typical newborn star would. "The low luminosity may be because very little stuff is being dumped on it," Evans said. The reason that astronomers are interested in studying starless cores, of which there are several in our galaxy, is because they may give some insight into the conditions that precede star formation. The fact that cores may not be entirely empty "will give theorists something to think about," Evans said. The second Spitzer finding shed light on how planets form. A group headed by Pontoppidan made a definitive detection of ice in a dusty disk that surrounds a young star. Ice or ice-coated particles had been detected around stars before, but it was unclear whether this material was part of an outer envelope around the star or from an inner planet-forming disk. To distinguish between the two possibilities, Pontoppidan and his colleagues used Spitzer's high sensitivity to look at a disk that was partly blocking the star at its center. "If the [starlight] doesn't pass through the ice, we can't see it," Pontoppidan said. Ice and other molecules can be detected by looking for specific types of absorption in the starlight's spectrum. If, however, a disk is seen edge-on, then there is too much absorption, and all that astronomers will detect is a dark bar across the background star. Pontoppidan's team found "an excellent target," with just the right amount of absorption to see that the disk had ice - mostly made up of water, but also containing frozen carbon dioxide and ammonium ions. The ice is detected at approximately 10 AU from the central star - similar to the orbit of Uranus. The astronomers speculate that there is ice at smaller radii as well. "These results tell us that up to half of the material in the disk is ice," Pontoppidan said. "This fits in with the picture of our own solar system." The star is less than a million years old, and will likely evolve into a star similar to our own sun. Perhaps we are witnessing in this far off disk what our own solar system's icy past looked like.